I'm back with another Friday Giveaway! 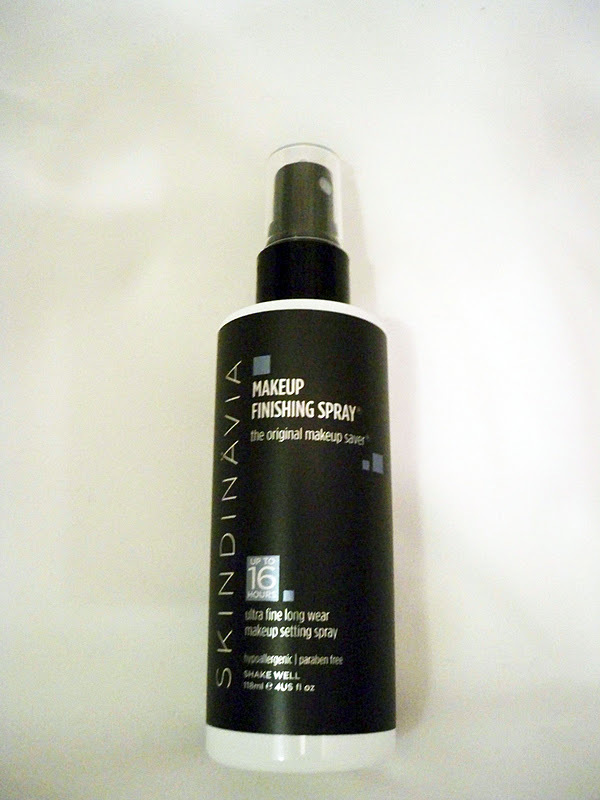 I am seriously in love with the Skindinavia makeup finishing sprays. You've probably seen me use them in tons of my YouTube videos. Well today i'm giving you a run-down of why I love the product, and of course I'll be giving one away to a lucky reader! This truly has been a must-have product in my kit and personal collection for the last year. I use it after every single makeup application. When I'm done with my makeup, I usually do 3-4 sprays to cover my entire face and then let it dry for about 15 seconds. I find that the product makes the makeup settle into the skin better...taking away any powdery, cakey look. It also makes the makeup last longer and it also serves as a makeup refresher. 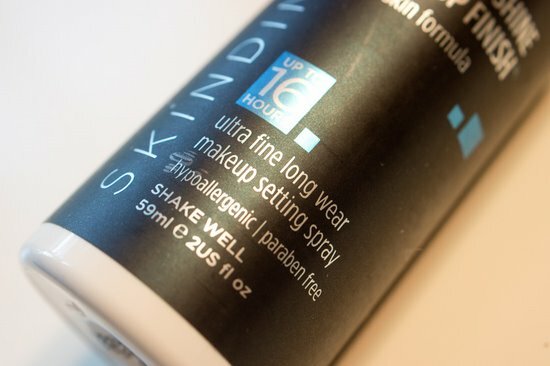 Skindinavia has several different formulas for different skin types and occasions. This includes No More Shine Makeup Finish, 10 Years Younger Makeup Finish, Moisture Lock Makeup Finish, and Bridal Makeup Finish. This isn't my first time talking about the product so you know that I definitely recommend it for the kit! You can find these products at www.Skindinavia.com They range from $19 (2oz spray) to $39 (8oz). I also just saw they have a coupon code: save20 for 20% off your order and free shipping, not bad! Good luck! Meanwhile, today I'm in Puerto Rico for vacation. I'm uploading this the night before. I'll see you guys on Tuesday! FTC Disclosure: Product sponsored for review and giveaway. I am not affiliated with this company and not paid to write this review. These are my honest thoughts and opinions. Thank you for the giveaway! I would like to win because I'm beginning to build my kit and this is something I could really use. I'd love to win because I really want to try this product as I have heard SOOOOOOOOO much good stuff about it. I'd love to win this product because so far i haven't tried a makeup finishing spray! I'd really love to win because I havent tried it yet. Cool giveaway! I would like to take your word for it and try this out if I win! I think I need one since my skin has been a bit dry this winter and all I'm using is a powder foundation! I've heard amazing things about this product! I'd love to try this because I'm always looking for new ways to improve the longevity of my makeup especially if I'm out all day. :D Thanks Ren! Awesome giveaway! I'd love to win the No More Shine spray. Thank you for another great contest! I would like to win b/c ive heard nothing but great things about it. I have a setting spray but its not the best not to mention the spray cap is horrible. I would love to win because I would to try this product out. I've heard such great things about this but haven't been able to buy it. I'd love to win this product because the only setting mist I've used was by ELF and it sucked. I don't have money for a pricey one either. I've heard a lot about this one though and I could definitely use this with school, my daughter and everything else going on. I would love to win this because I've heard so many things about. I've never tried a setting spray other than the ELF one but I'm sure it this one is much much better! I'd Love To Win This Product Because I Always Hear How Great It Is & I'd Love To Offer This To My Clients. I've heard many good things about this spray, but I never tried. because shipping is quite high to Slovakia. I have oily skin, so I would be most pleased with this. Thank you for the giveaway RenRen. I've been interested in this product because i have tried Mac fix+, Urban decay and makeup forever. I don't really like any of it and hoping to try this one since you've been talking about it a lot. I would love to win this because I've wanted to try these for ages. I would to win this product because I have heard so many great things about it and I would like to try it! Thanks you and enjoy P.Rico! Hello! I am a GFC follower, and I would love to win this because I live in a tropical country (which makes my makeup melt so bad) so this would be super perfect to keep my makeup on! I would love to win because I have been interested in trying the Skindinavia spray for AGES! Thanks for the contest and have a great vacation!!!! I would like to win because I'd love to try the product and see if it's something that would help my makeup last longer for my wedding! Thanks for the giveaway! I iwll love to win this because I will love to try this product! I appreciate your review, soif you like it, it means is good! thnx for the giveaway! I would love to win because I have been interested in finishing sprays for a while but just never wanted to fork up the money to buy one due to the fact that there are so many. I have two kids so I want something I know will work first shot for my extra oily skin. I would love this opportunity to win! Thanks Ren. I would like to win this because I love trying new products and new brands. Also, I'm looking to expand the products in my makeup collection and this would be a great way to try something new. Apart from being a total and complete lover of makeup, i am on a continuous search to introduce new, qualitiative and definitely incredible and innovative products into the Nigerian makeup industry. Makeup setting sprays are still relatively new in our market and are very hard to find (if u find at all), winning this giveaway will provide me with an opportunity to not just use the product and review it on my blog but also to introduce it to Nigerian makeup artists which i know will be very revolutionary and very welcome. i hope i win it. a lovely new year introduction it will be to the Nigerian beauty industry. I'd love to win this product because I'm always looking for the best product. Fix+ spray usually leaves me greasy later on in the day and this seems like a great alternative! It's always great to use and hear about brands that not a lot of people know about as well. We don't always have to buy in department stores, ladies! i would love to win this finishing spray because i have heard and seen so many amazing reviews and results using this spray and i fell in love! i never ever tried this a finishing spray before let alone this one:) i really would love to win/try it to make an help my makeup & mostly my clients makeup look flawless and last all day long:) thanks so much RENREN! I would love to win this because i have heard alot of good things about it from beauty gurus ! so hopefully i will win to try it ! I'd love to win this product, I've been admiring it for a while, and would love to try it. This would perfect for my up coming wedding day!! I've been wanting to purchase this product for the longest but can't seem to fit it in my tight budget. Thanks for the opportunity to win! ever since you started talking about this product i've been wanting to try it soo badly.. i really need something that will refresh my face but i tend to get oily.. ughhh it frustrates me lol will love to try the No More Shine Makeup Finish.. I'd like to win because I have extremely oily skin and my makeup tends to melt off within 1-2 hours of application. I'd love to see if this works! Is love to win this because I have extremely oily skin and I need something to help my makeup last, because nothing seems to help. I want to win because I have combination skin and I noticed that by the end of the day my makeup is faded. I would like to try it because I've heard so many great reviews on it and I think it would be cool to use it on my wedding that is coming soon! I'd love to try this because I have combination skin and my forehead gets so oily and shiny that my foundation tends to melt away after a few hours. Maybe a setting spray would be the solution? I would love to win this because I want to try it since forever!!! This product would be a great addition to my kit. I'm really focusing on building my kit with quality products and I've heard and read good things about this finishing spray. Thanks for the giveaway,I would like to try this product, because I live in the Caribbean and it seems as thou makeup just melts way. I would love to win this product because I would love to become a make-up artist and a student in high school so I am on a tight budget and winning this would help a lot. Thankss for this awesome giveaway !! I would like to win this product because I would try anything to have my makeup stay longer. One reason I would love to try this product is because of the wonderfully things I have heard about it. Secondly, I need a good finishing spray. Lastly, I need a product like this that will keep me looking flawless the entire day. thank you!! !Have a nice day! I would love to win this product because I hear so many great things about it plus I'll love to have it apart of my kit. Great Giveaway. I would like to win this products because after reading the reviews and hearing the rave and knowing at this present time I can't afford it. I must have it apart of my kit. I would Love to win this product because Ive been searching for new ways to set my makeup for drag! I would love to win because I have the urban decay one that is made by the same company however, i only got the small bottle to try and i'm running low, would love to compare them!! good luck to everyone. have fun on your vacation, you deserve it!! Hi RenRen, I would love to win because I would love to have this in my kit! I am out of fix+ and have been too lazy to get something to replace it. Setting sprays definitely polish off a look! I would to win this giveaway because I love to try a finishing spray..and I think it is good for my oily skin. I would love to try this out as I have never used a finishing spray before. As a university student in the middle-east, I would love to try this to prevent my makeup from melting during those special occasions. In addition, I have heard fab reviews about this product but unfortunately, its not available in my country. I want to try this product now. Awesome! I would love to win this setting spray, since i have not tried this spray and it is on my wishlist for christmas :) Thank you for the giveaway and have a great vacay in puerto rico! I would love to win this product because I have heard so many good things about this product. They make urban decay all nighter. And I have to tried it and I love it. I simply want to try this product. Tx for the opportunity.